Meet this week’s trio, Helen, Felix and Girl! Helen is a mostly blind and completely deaf dapple mix. She came from a very nice home but the daughter was going back to college. The parents were ill-equipped to give Helen the care that she needed, and became an owner surrender. The family tried their best, but they were not quite ready for a dog with that many special needs. Helen is a rambunctious, fantastically affectionate and very smart girl. She follows her nose and uses the shadow information she gets from her eyes to find her way around. It took her less than a day to learn her way around her foster home, including using the front yard and how to use the dog door. Helen gets along well with the other dogs and is simply amazing. Felix is a small, long haired Dachshund. He gets along with everybody and has earned his name, Felix, because of his happy and friendly attitude. Felix had once been physically abused, including being thrown against a wall. Despite his hardships, Felix has a big personality for being the little Dachshund he is. Felix took immediately to the dog door in his foster home just like Helen! Daisy (Girl), is a wire-haired dachshund mix, with a very sweet personality. She caught the eye of her foster mom in the shelter kennel, right next to Felix. Girl was house trained already and used the dog door, making herself at home to her foster. Not only did Daisy come in with Felix, but her demeanor was so calm, accepting, and loving even in the chaotic shelter. 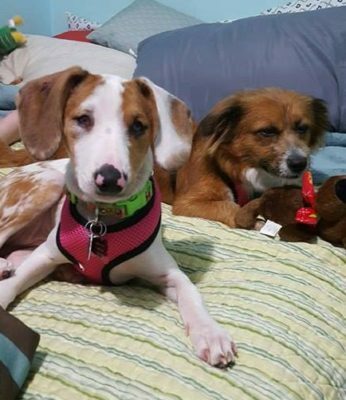 The shelter had them listed as dropped off together, but, they were never reclaimed. All three are very smart, very adaptable dogs with big personalities and are unforgettable. The volunteers on their transport say they enjoy and know the importance of all transports because they are all rescues. 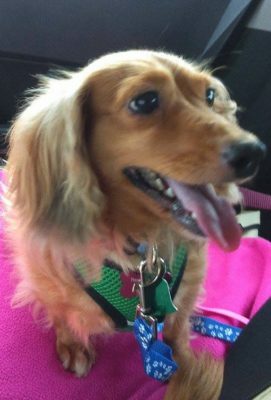 What made this transport for Felix, Girl and Helen, their little blind and deaf Dachshund, even more special was knowing their stories and knowing that they are going to one of the best Dachshund rescues to find their forever homes. Felix, Girl and Helen are now waiting for their forever homes at Denver Dachshunds Rescue in Colorado.